“Anthophilia” is the love of flowers. 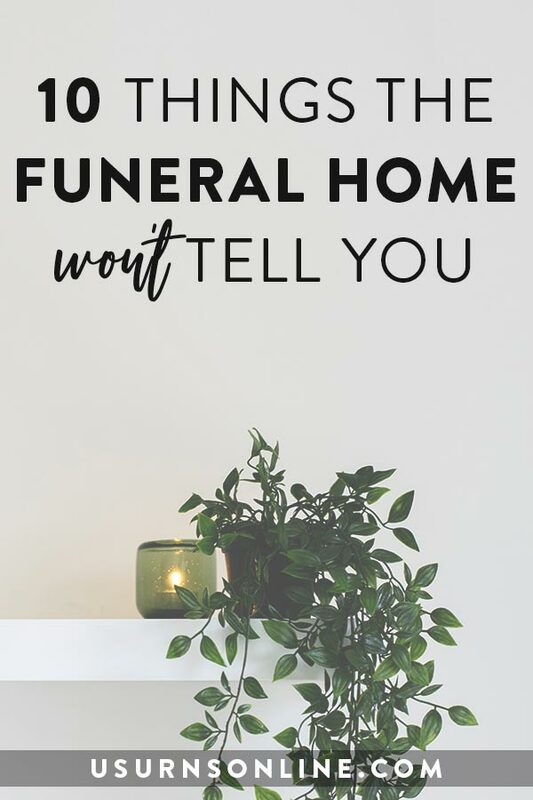 Below, we have selected the very best flower cremation urns for your consideration as a memorial to your beloved anthophile. 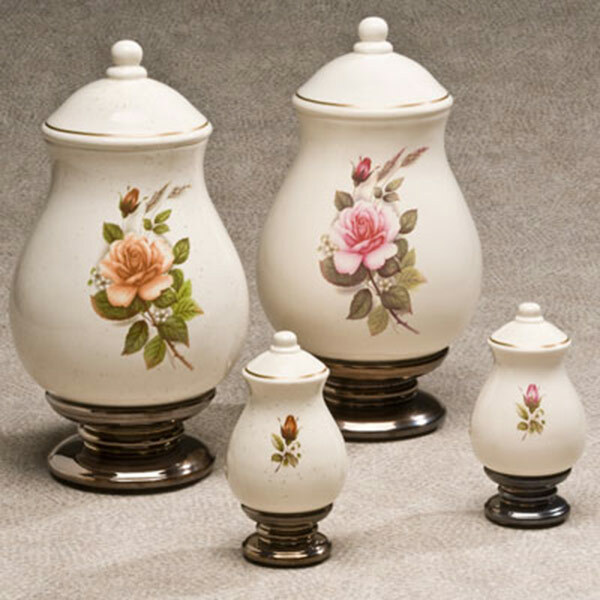 If your wife, mother, grandmother, or other loved one was devoted to flowers, you’ll find the perfect floral tribute among our collection of flower cremation urns. 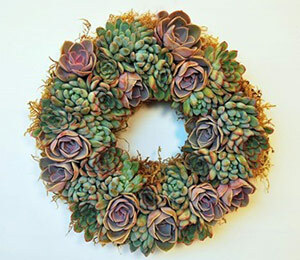 These are ideal for anyone who loved gardening, flowers in general, or a particular variety such as roses, lillies, carnations, and many other types. 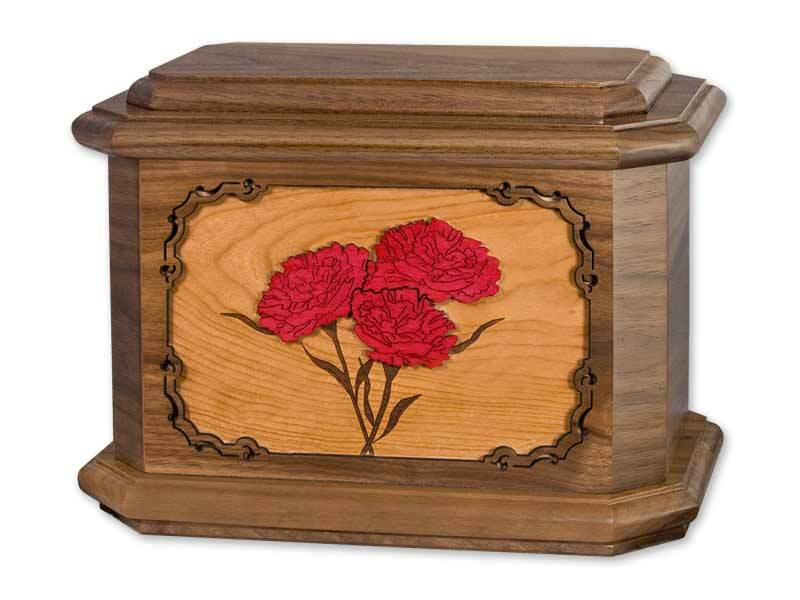 Our flower cremation urns collection includes the stunning Red Carnation Flower Cremation Urn. 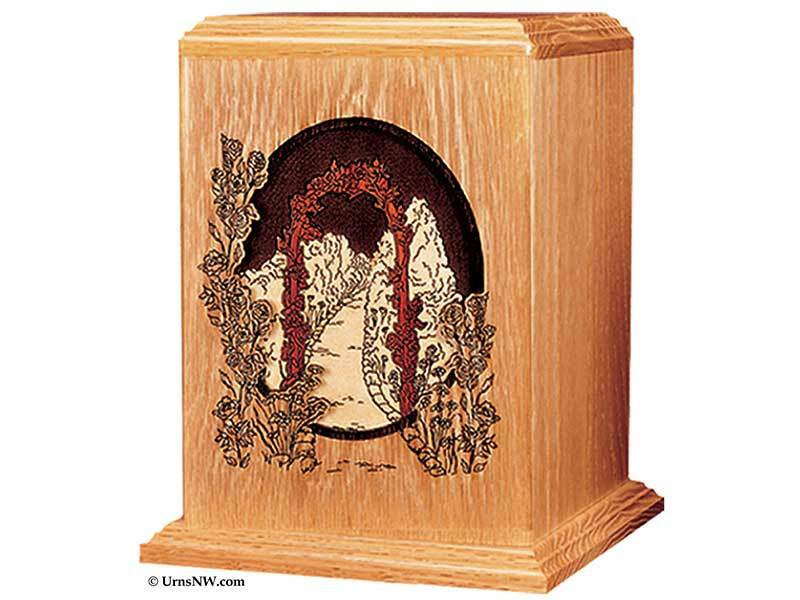 This wood inlay art piece features brilliant red carnations crafted from real Maple wood with a red cherry stain. The carnations are set over a background of solid Cherry wood, which causes the flowers to “pop” and catch the eye. 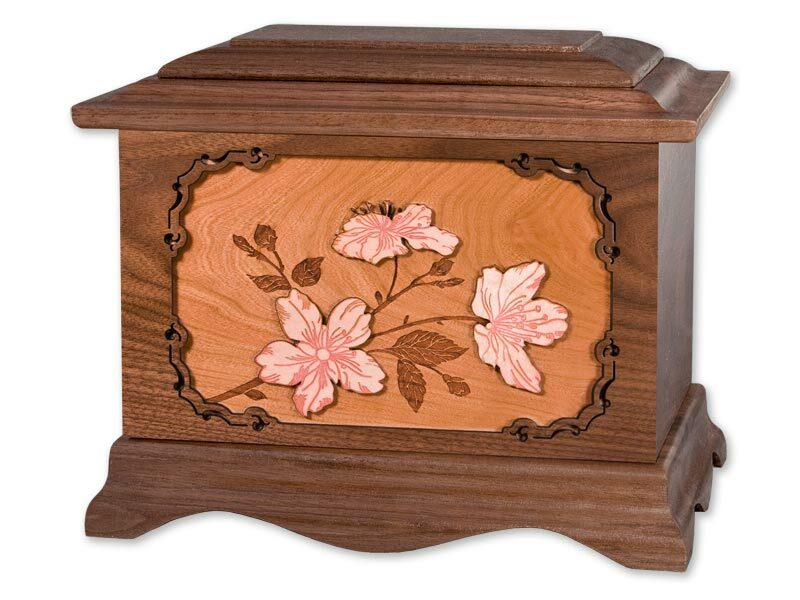 This gorgeous 3-dimensional wood inlay art urn features a lovely rendering of cherry blossoms. 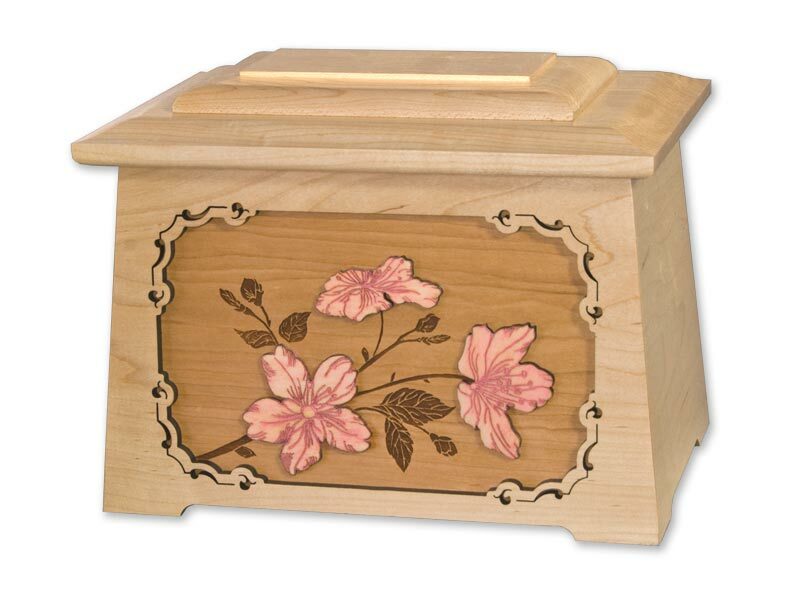 Crafted in the USA entirely from premium solid wood, our Cherry Blossoms Cremation Urn is a beautiful tribute to one who loved the spring blush of cherry blossoms. Pictured here in Walnut wood, the urn box is also available in Oak or Maple. 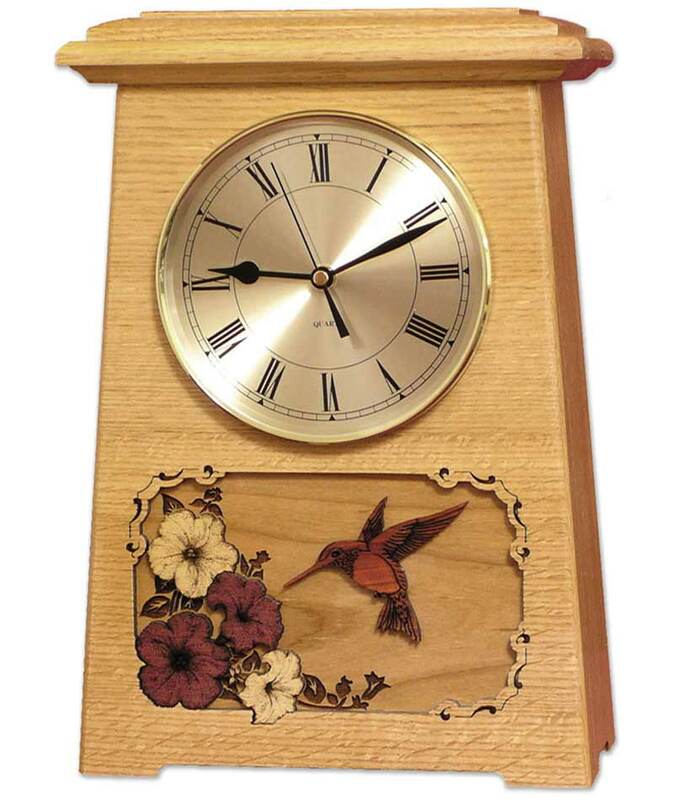 The background is Cherry wood, engraved in fine detail with the branches and leaves, while the blossomes are white Maple with a very light Rosewood stain. 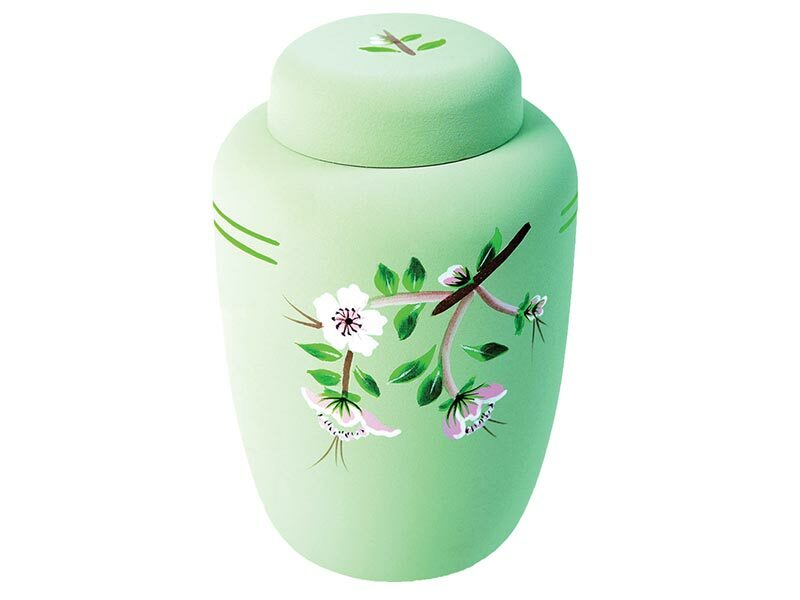 Our Floral Green Biodegradable Cornstarch Urn is designed for an eco-friendly burial. 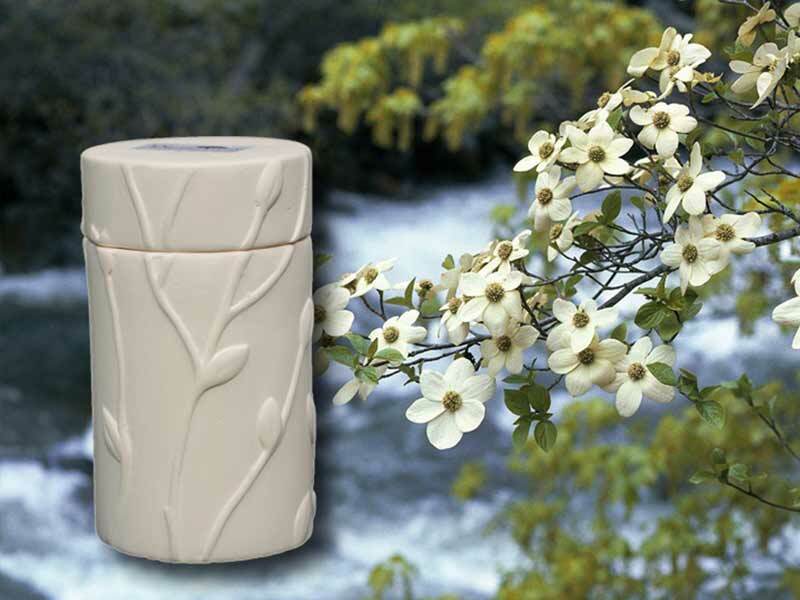 Made in the USA from durable and environmentally-friendly cornstarch, the urn will naturally biodegrade when buried. 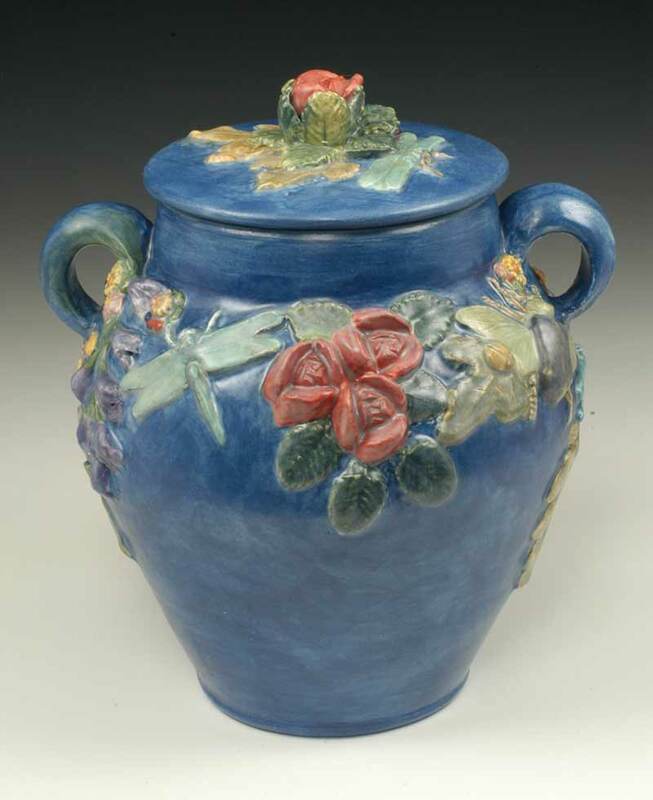 The earthy green urn is hand-painted with a decorative floral design featuring white and pink cherry blossoms. 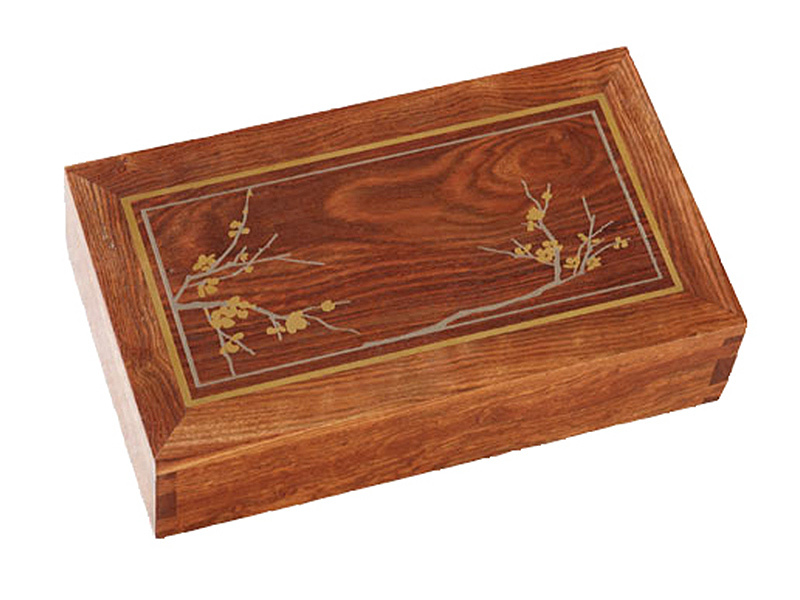 A perfectly constructed rectangular box, crafted by hand in the USA from Caribbean Rosewood, our Cherry Blossom Silver Inlay Rosewood Urn presents a sentiment of delicate beauty combined with heirloom quality craftsmanship. 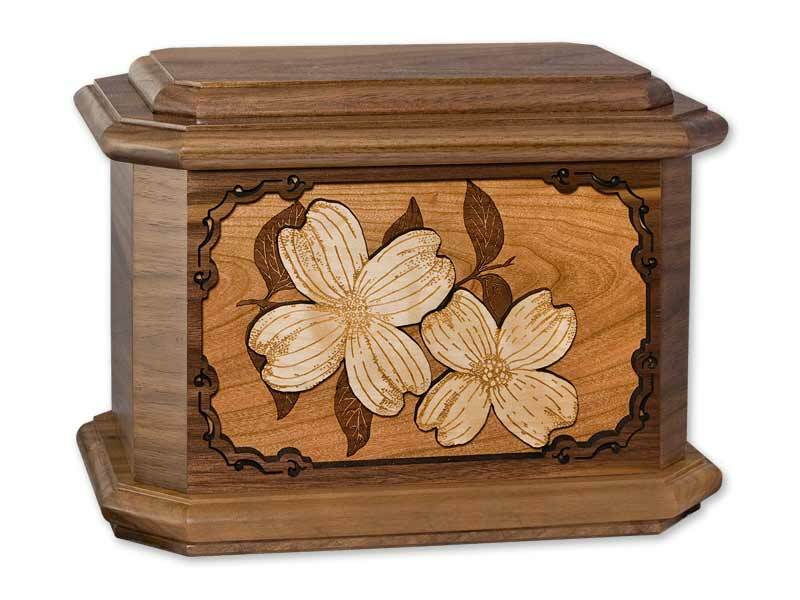 Also available as a memory chest with hinged lid opening, this flower cremation urn uses solid hardwood with dovetail joints for a premium look. The top is laser etched with a simple cherry blossom floral design, which is then inlaid with a metal alloy of real silver and nickel. Part of the inlay uses the silver alloy in gold-color, which is colorized using an oxidizing process which results in a lovely gold toned design. The urn (or memory chest) is finished with hand-rubbed wax for an exquisite finish which will improve over time. 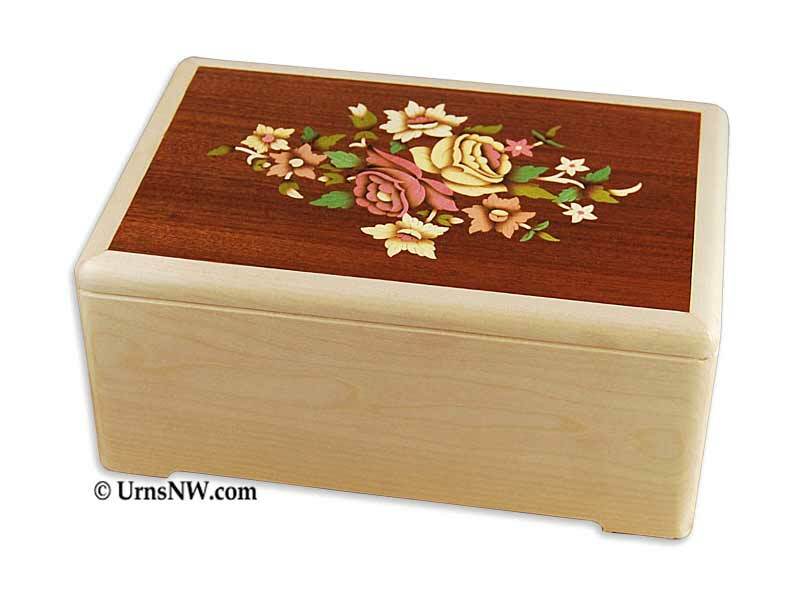 The Cherry Blossoms Astoria Cremation Urn uses the exact same flower wood art inlay scene as the Walnut urn above, but in our popular craftsmanesque “Astoria” shape. 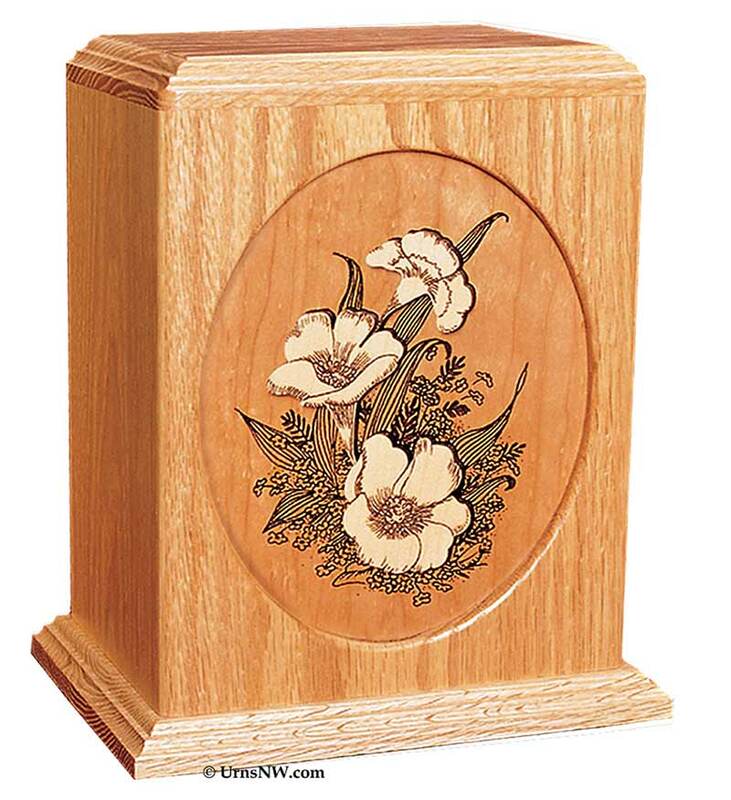 Pictured here in white Maple wood, this flower cremation urn is a beautiful tribute to your loved one and is made with superior skill and craftsmanship in the USA. 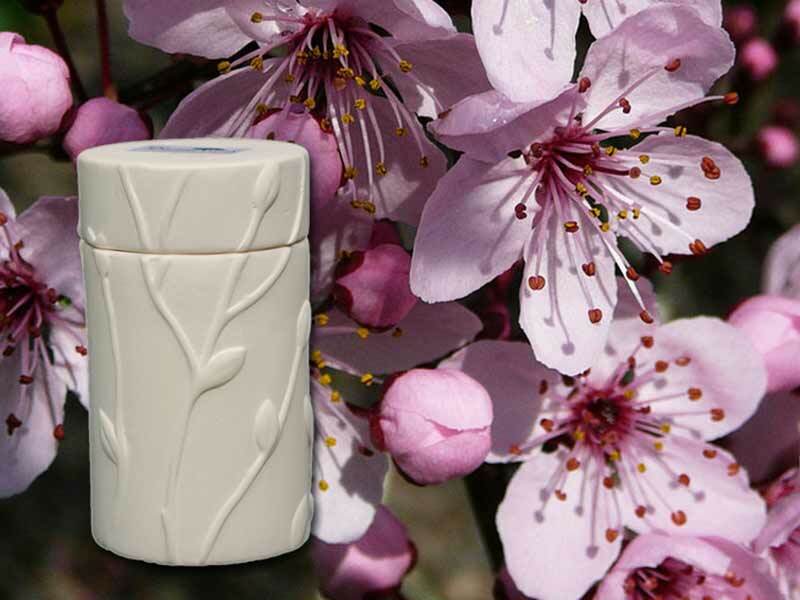 One of our most unique products, the Flowering Cherry Memorial Tree Urn is a small (35 cubic inches) biodegradable urn which includes live Cherry Tree seeds. Fill the urn with a small-to-medium amount of cremated remains, bury it in an appriopriate and memorable spot, and as the urn biodegrades the materials mix with the remains to create an unique mixture which will incorporate the “ashes” to help sustain, nourish, and grow the Flowering Cherry Tree. 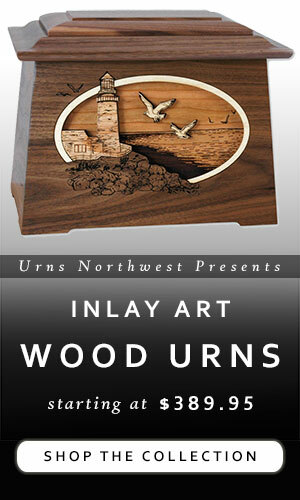 For more information about our memorial tree urns, see here. You can browse all varieties of our memorial trees here, including standards such as Oak, Dogwood, Blue Spruce, and many more. 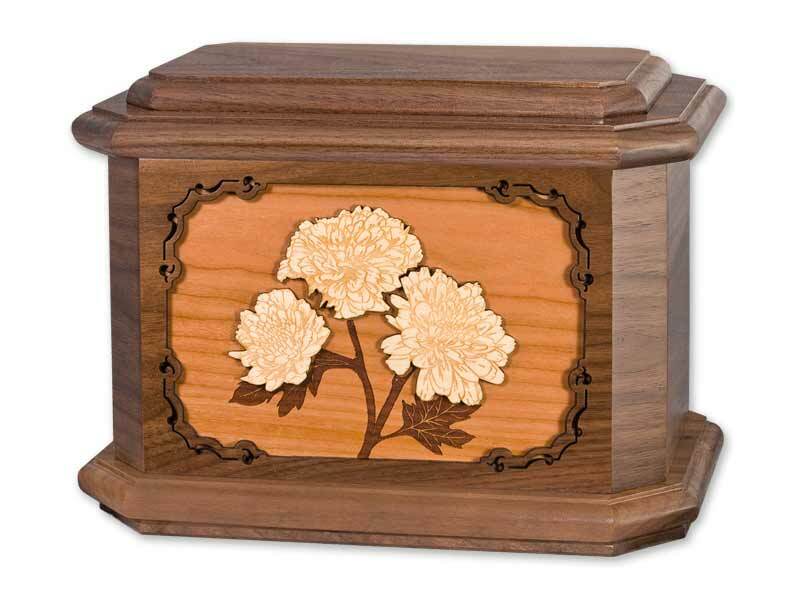 The Dogwood Flower Cremation Urn is pictured here in Walnut wood, crafted in the USA in our classic eight-sided “Octagon” shape. Two giant Dogwood flowers, cut out from white Maple, are etched with perfect detail and set over a background of Cherry wood. The simplicity of the design highlights the beauty of the flowers, making it perfect as a memorial for your beloved gardener or flower lover. Another memorial tree urn, like the Flowering Cherry above. Use our Biodegradable Dogwood Memorial Tree Urn to fill with a small amount (35 cubic inches) of remains, plant in the ground, and grow a gorgeous Dogwood memorial tree. More info here. 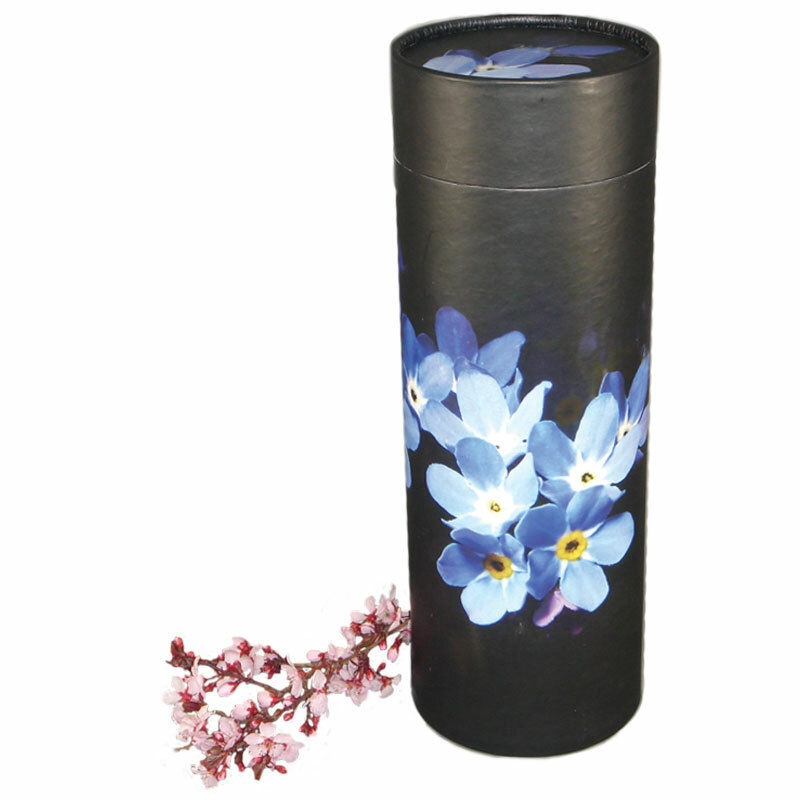 Forget Me Not flowers adorn our gorgeous Tribute Scattering Cremation Urn Tube. Made in the USA from biodegradable materials, this scattering urn provides a lovely flower-themed way to return your loved one to the earth. Available with optional personalization of photo and inscription on the lid of the urn, this Forget Me Not flower cremation urn is a wonderful tribute to honor your beloved gardener. 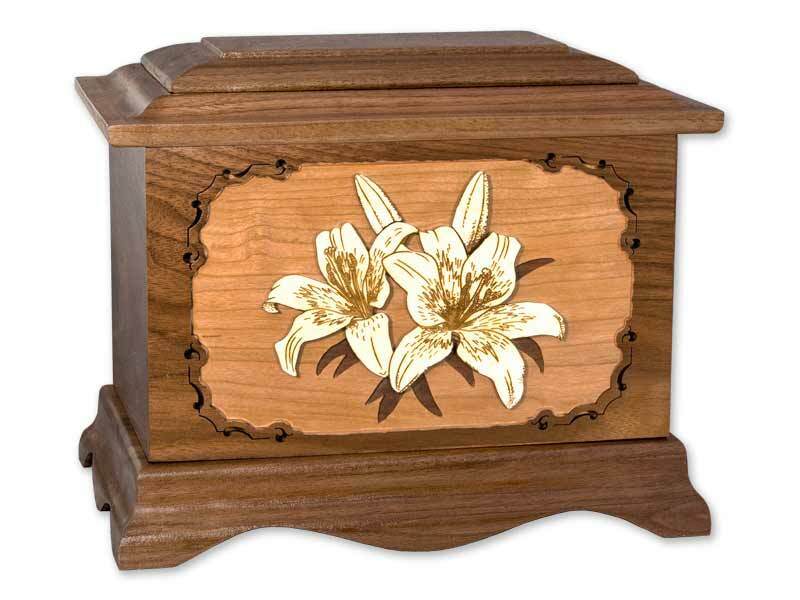 Our collection of flower cremation urns includes the stunning Lilies Cremation Urn with Floral Wood Inlay Art. 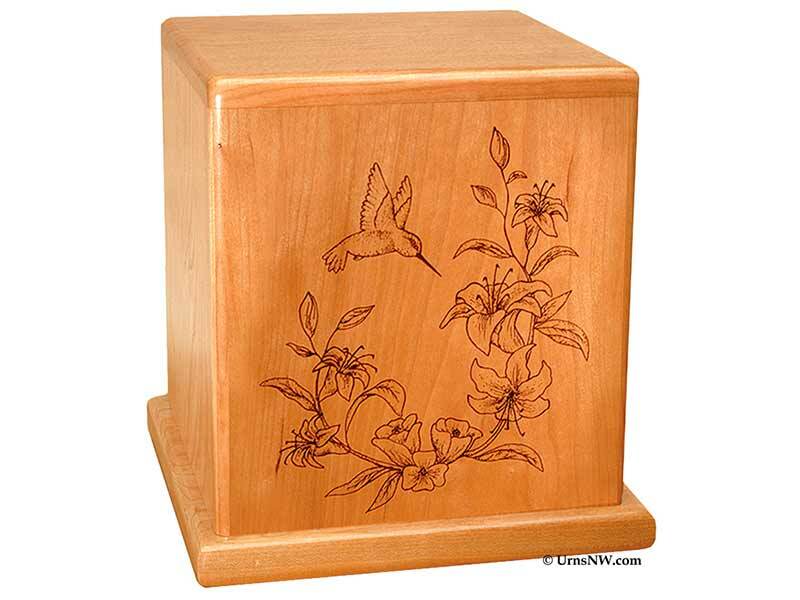 This premium wooden urn boasts blooming lily flowers made from solid white maple wood, engraved in fine detail over a background of cherry wood. 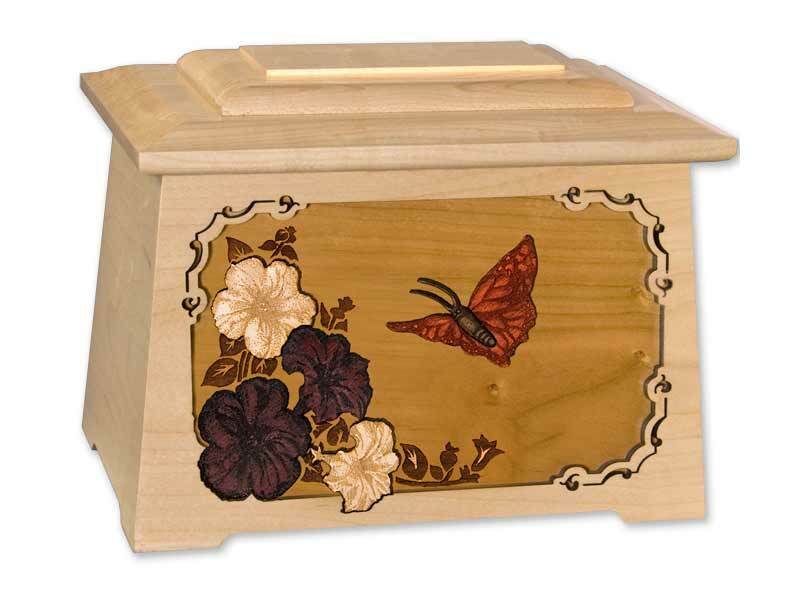 Pictured here in Walnut wood, the urn box is also available in Oak or Maple wood. Made in the USA from start to finish. 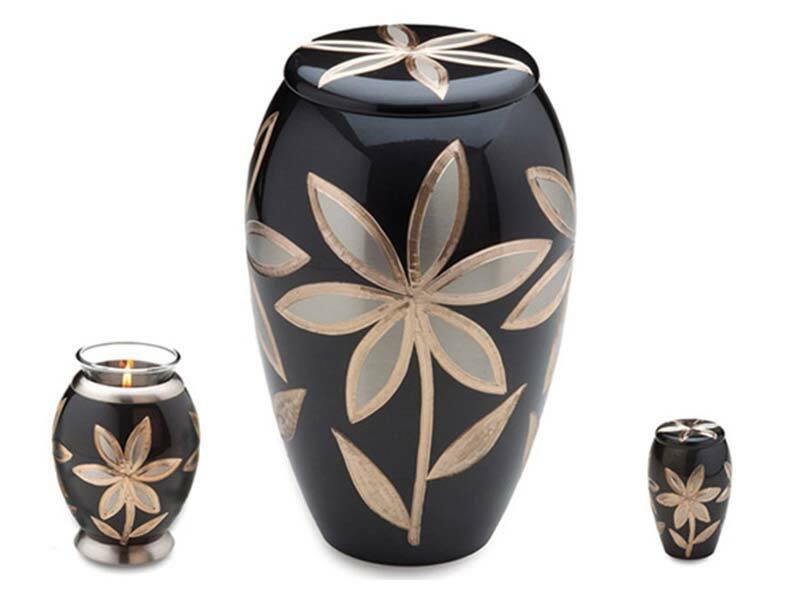 The Majestic Lilies Brass Cremation Urn is an alluring piece, showcasing bright modern lily flowers in stunning gold (brass) and white colors over a glossy “midnight dark” coat. Protected by GlossCoat technology, which allows the urn to retain its shine, this lily flower cremation urn is available in standard adult, mini tealight, and small keepsake sizes to suit the needs of your family. Here’s a closeup of our Tealight Brass Keepsake Cremation Urn with Lilies. 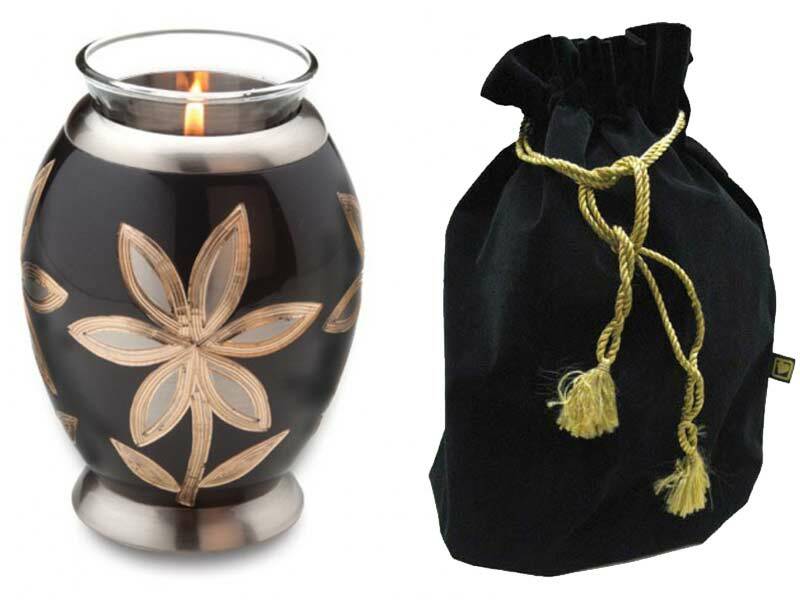 Made from solid brass metal with a working tealight, this urn is a small keepsake that holds 20 cubic inches of ashes, and includes the exquisite velvet keepsake bag as pictured. 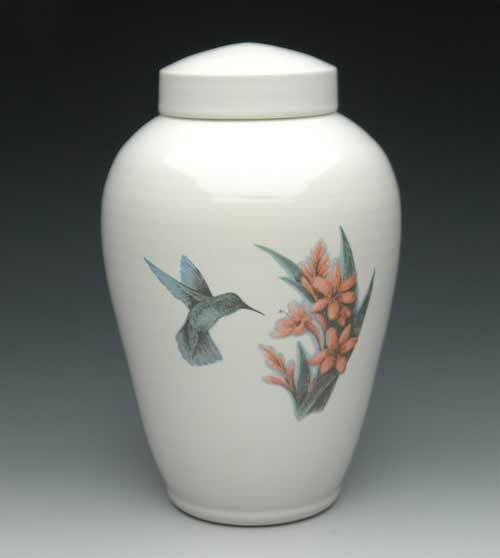 This cherry wood urn depicts a hummingbird flitting above wild Tiger Lily flowers. 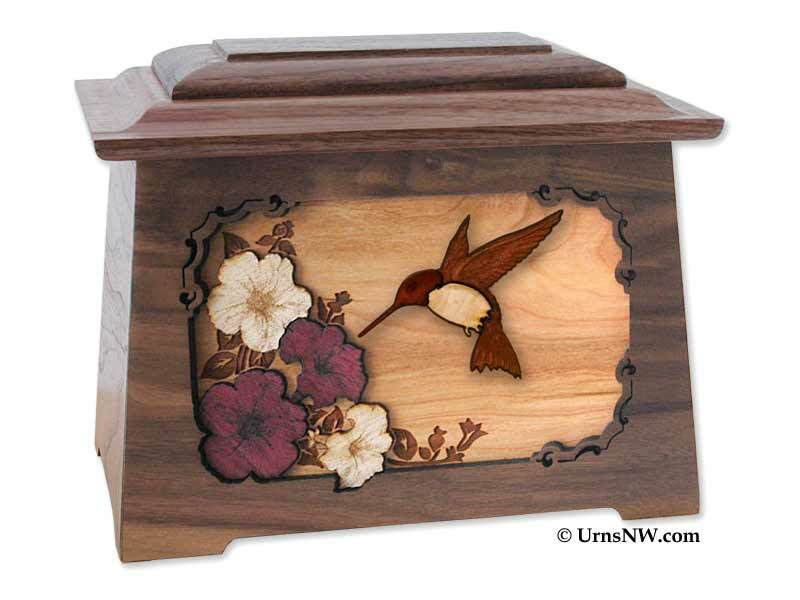 The Hummingbird Cherry Wood Urn is made and engraved in fine detail in the USA from premium cherry with a lovely clear finish. 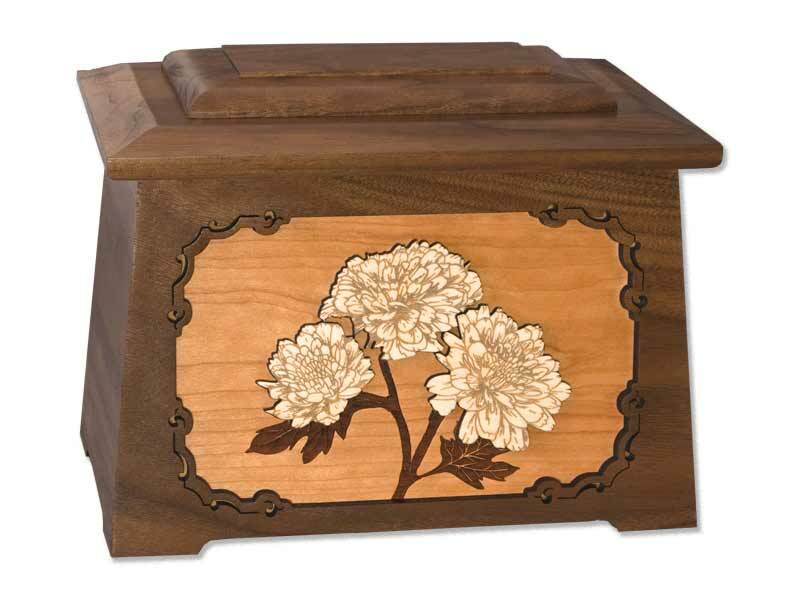 The chrysanthemums peacefully bloom as the centerpiece of our Mums Flower Cremation Urn with Wood Inlay Art. The lovely “Octagon” shape, shown here in Walnut, is made from solid wood in the USA using your choice of Oak, Maple, or Walnut. Mums are an ideal choice as a floral tribute for any flower lover or gardener, especially your beloved Mum. The same gorgeous “Mums” flower cremation urn scene, built in the USA from premium solid wood and pictured here in our Craftsman-esque “Astoria” shape. This one is shown in dark Walnut wood, which contrasts perfectly with the white Maple Mums and the Cherry wood background, but it is also available in Oak or Maple. The Tranquility Wood Cremation Urn with White Roses conveys a sense of timelessness with the artistry of the wood combined with hand-crafted ceramic white roses, which ring the neck of the vase-style wood urn. 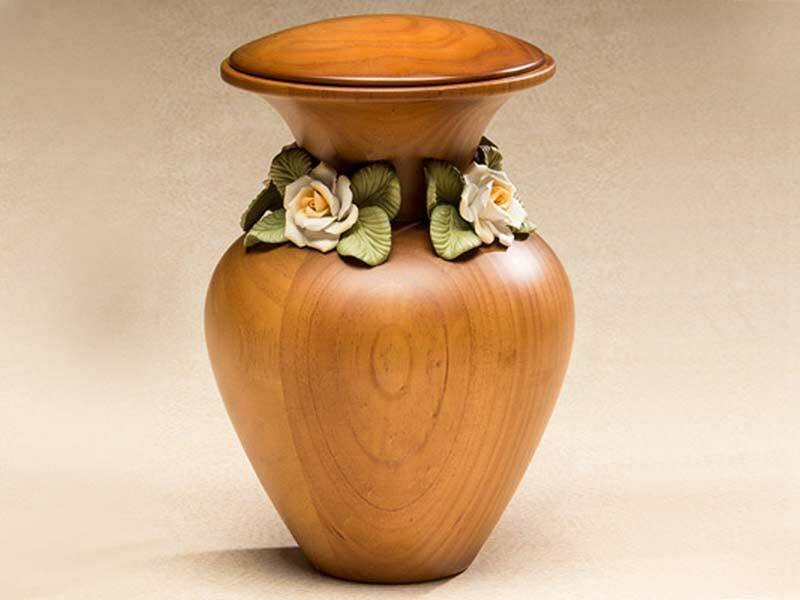 Made in a family-run woodshop in Spain using locally grown hardwoods, this flower cremation urn exhudes warmth and vitality. 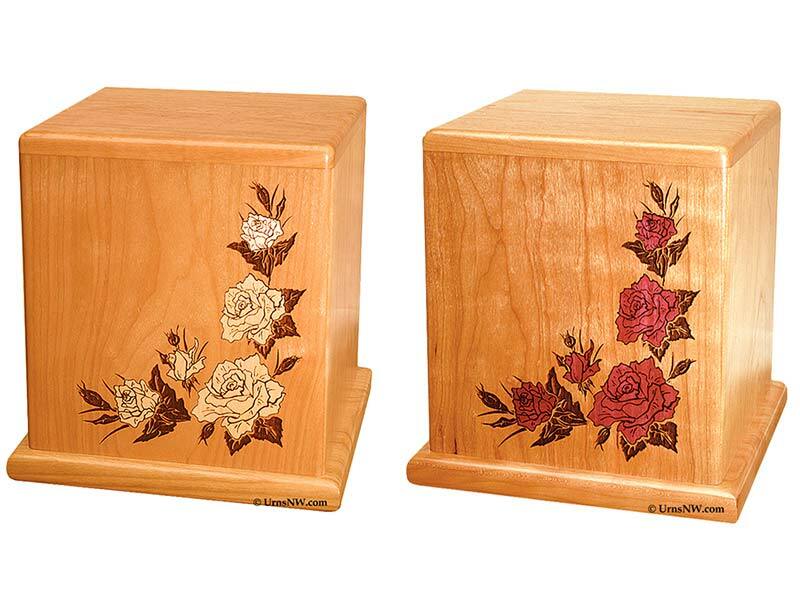 These solid cherry wood cremation urns made in the USA from premium hardwood and feature an engraved rose inlay made in your choice of red roses (which uses rosewood) or white roses (maple wood). The design and layout presents the perfect template for adding laser etched customization of name and dates. 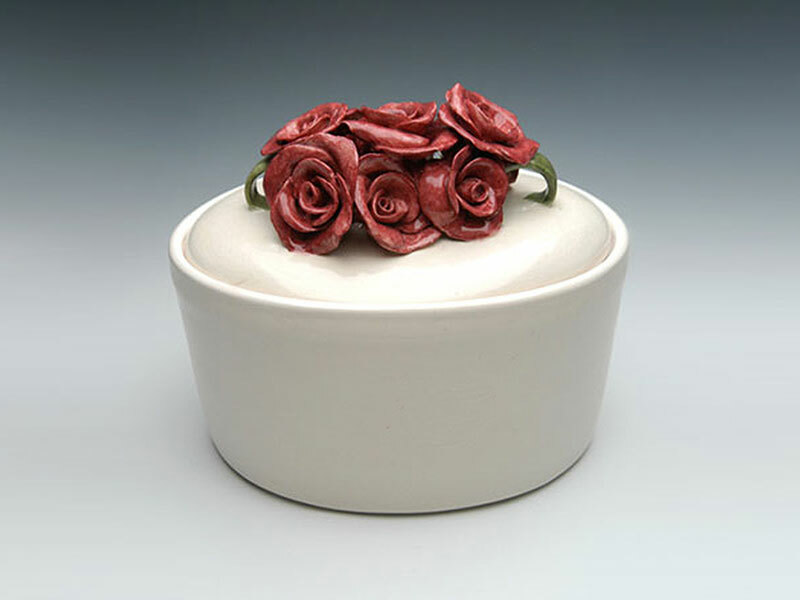 Handmade in the USA, this oval-shaped ceramic urn vessel is available with the roses on top in your choice of red rose color. 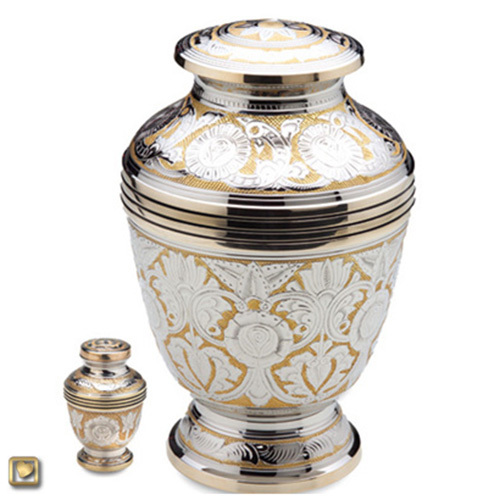 The Oval Rose Ceramic Cremation Urn will convey a wondrous sense of beauty captured in the refinement of the roses. 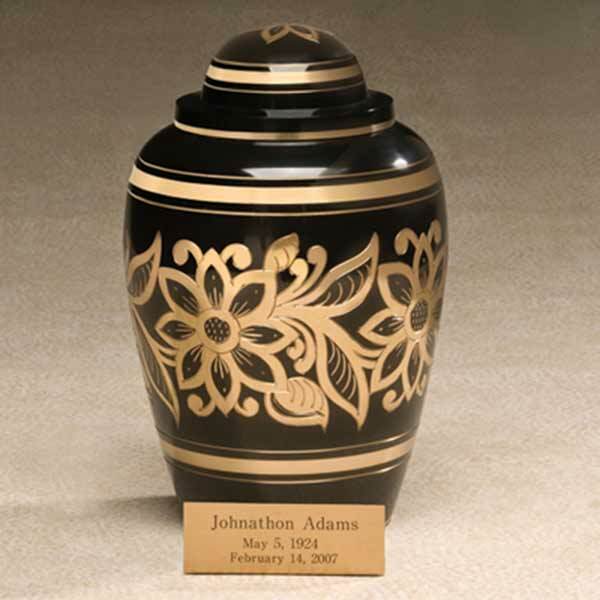 Brilliantly simple yet stunningly intricate, this ceramic urn is a tender memorial which can be inscribed on the front with custom text such as name and dates. The Rose Ceramic Cremation Urn is a delicate floral urn exquisitly cast in ceramic in your choice of rose color – Pink or Sienna, with matching miniature keepsakes available. 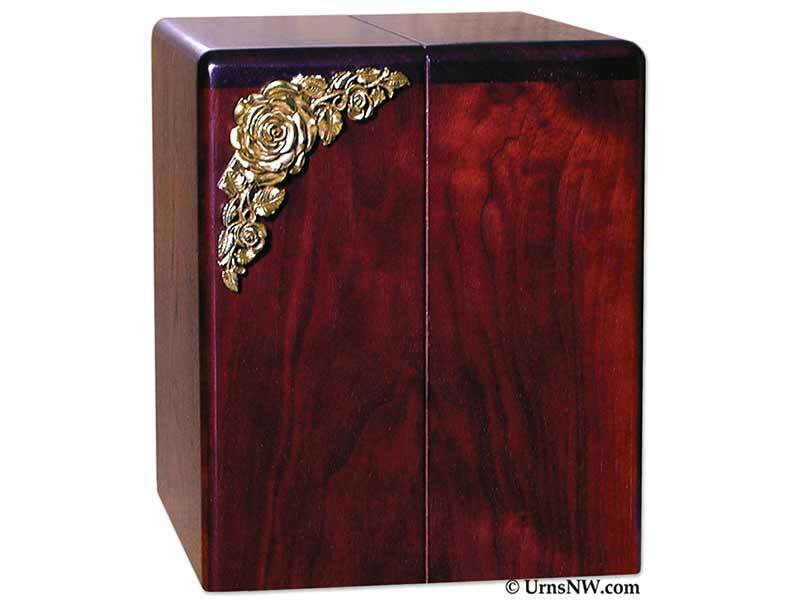 A companion sized urn for two individuals, the Roses Wood Companion Urn is crafted in the USA from solid walnut wood with a premium Rosewood finish and an ornate applique of roses. 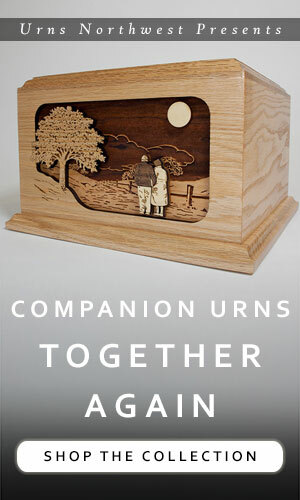 We have even more Rose Cremation Urns available – you can browse all designs and styles here. 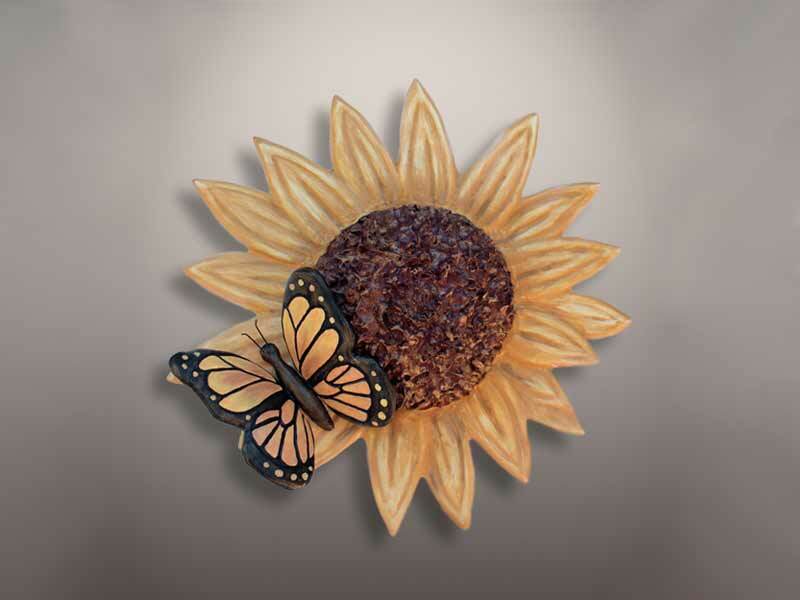 The Handmade Ceramic Sunflower and Butterfly Cremation Urn is designed to be mounted on the walls of your home, a beautifully detailed flower memorial tribute to your loved one. As an art decor piece it stands on its own with incredible detail and craftsmanship, while doubling as a cremation urn to hold up to 115 cubic inches of remains inside the vessel. 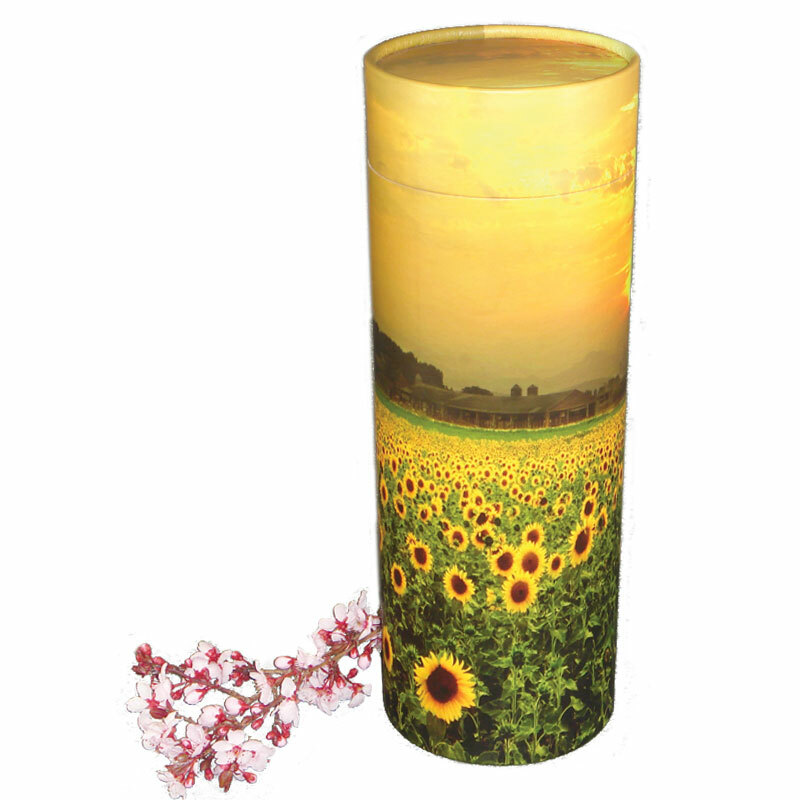 The Sunflower Scattering Urn Tube presents an idyllic field of sunflowers blooming against a yellow sunset sky. Designed for an earth-conscious ash scattering, this sunflower urn tube is made in the USA from 100% recycleable materials and affords you a beautiful and simple method for scattering the remains, perhaps even in the middle of a field of your loved one’s beloved sunflowers. 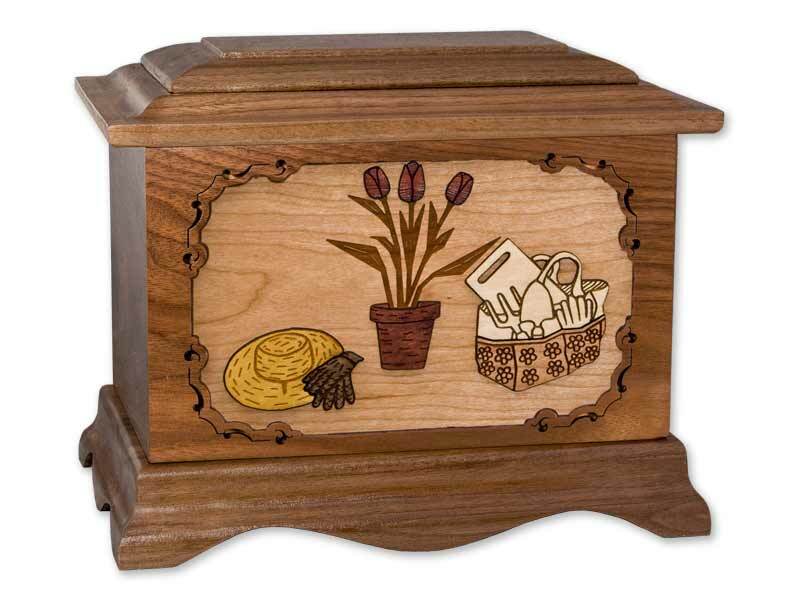 Designed for the one who loved gardening, the Ambassador Gardener Cremation Urn incorporates wood inlays of walnut, rosewood, maple, and yellowheart to create a touching gardening scene with tulip flowers as the centerpiece. Made in the USA from premium materials, the Gardener Urn is pictured above in Walnut but can also be made in Oak or Maple. 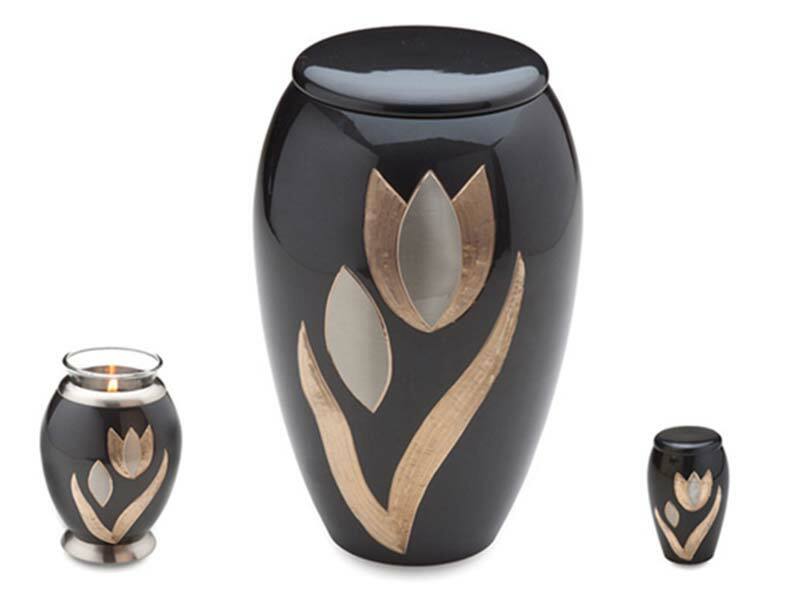 The Majestic Tulip Brass Cremation Urn is artfully crafted from solid brass with a “midnight dark” finish which uses luminous GlossCoat technology to protect and beautify the urn. Available in three sizes (standard adult, miniature “tealight”, and small keepsake), the modern tulip design is minimalist yet alluring to honor the memory of your loved one with a beautiful tulip memorial urn. 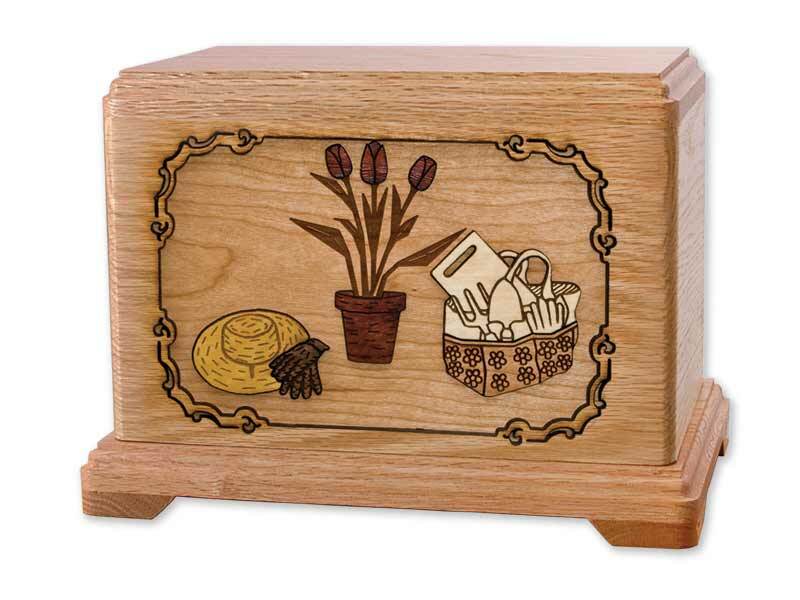 The Gardener Cremation Urn is an earthy wood urn with inlay art comprised of a gardener’s standard accessories. Tulips spring from a rosewood flower pot, surrounded by yellow heart wood gardening hat, walnut wood gloves, and maple wood gardening tools set in a cherry wood inlay. 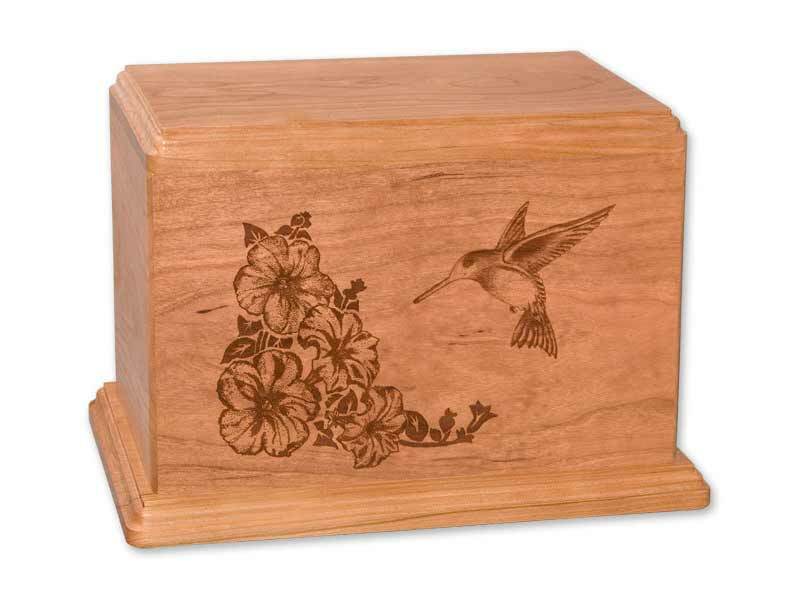 The box for the Gardener Cremation Urn is pictured above in Oak, and is also available in Maple or Walnut wood as well as in our popular Ambassador style. 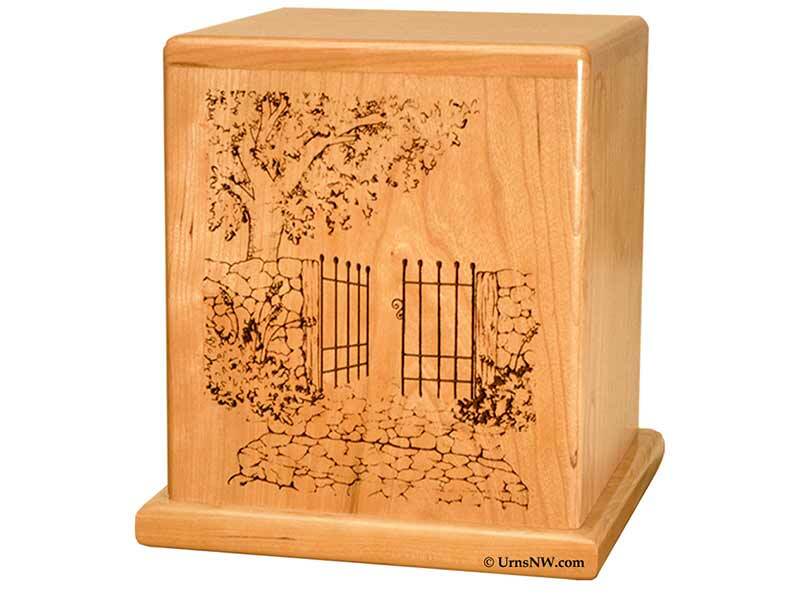 The Garden Gate Cherry Wood Urn is built in the USA from premium solid cherry wood, laser engraved with an emblematic garden gate image which represents your loved one’s final journey into the eternal gardens. The Garden Walk Cremation Urn symbolizes the passage of your loved one into the next life by means of a floral archway leading into a picturesque garden. Ideal for the gardener or flower lover, this wooden urn features several layers of hardwoods inset in their natural colors and engraved for detail to create an intricate and verdant scene. The arch oversees a homey garden pathway and is surrounded by laser etched roses blooming with unfettered beauty. 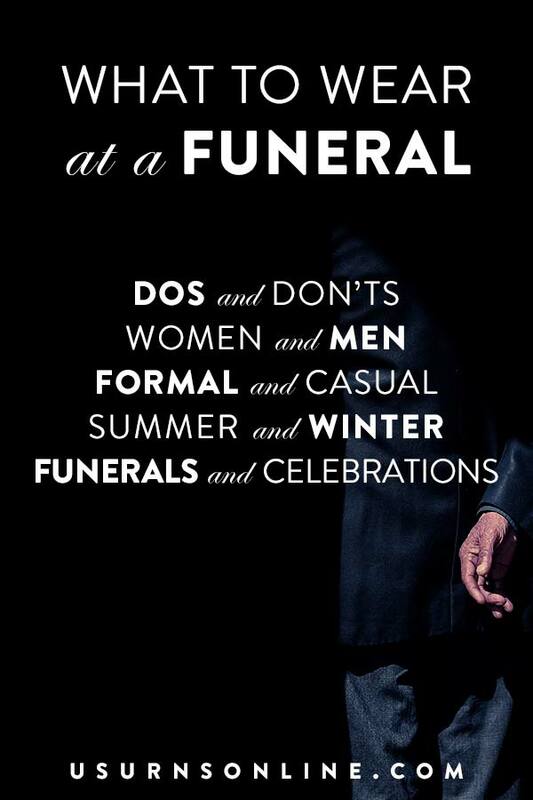 Previous post: Mailbag: Can I Remove Ashes from an Urn to be Scattered? I really like your Tranquility Wood Cremation Urn in Radiata with White Roses; however, my Mom loves Yellow Roses….Could this urn be made with Yellow Roses? Great question! Because these are made in Spain, we are not able to do custom color requests. But if you or someone you know is very talented artistically, you could perhaps paint the roses yellow.